I have a lot of work in progress… As always! There are masses of flies in the studio tent, but thankfully they do leave when I come in and work in there. Not much sign of snails in there even, except in a few damp crevices! And I have now realised that I do get sun burnt even when inside the tent… translucent tarpaulin is not great at keeping UV rays off the skin! Congratulations NHS! On your 70th year! When posting this journal, finally….It’s a long way back. It’s freed me to paint and work, and I am grateful every day I wake up with a working knee! I can carry things, move work around, paint big paintings, and have big dreams. Before my knee replacement my whole life was starting to run into a funnel, with a very narrow spout! I’m not going to post lots of images of paintings in progress… I really have far too many and it would become quite pointless. Because I work in such a piecemeal way, I have to work more on relinquishing the work when it is in progress, rather than tracking it. I find this more helpful to my self. It’s an odd way of working. But I think its about picking up pieces. And I have so many pieces. Picked up and put down. Not normally advised as a good way to work. For for the abstract painting process it works very well for me. This also applies to my many notebooks, reading and research. It’s a constant process of losing and finding things. And unexpected relationships occurring. With a lot of contemplation in between. I am very much loving the sol-silicate paint I use from Keim Paints. It’s AMAZING… and as I am working outside in the very hot sun, it is also very healthy! I do wear gloves if I know I am going to be handling a lot of paint, because it is very alkaline. It’s drying quick…I use Soldalit. Very fine brushes are best, I find, but rollers can be useful. The light bounces off the matt surface beautifully. It takes hours to make many pots of paint ready for a painting session. Well worth it though! I love this paint. It’s heaven! I first started using Keim mineral paints a few years back. I do use acrylic paints too, but I wouldn’t use large amounts in the sun anymore. I could smell the fumes coming off the surface of the paint in the hot weather, and thought to myself, “NO, no NO!” This isn’t good for me. As I have to paint large scale out of doors, and very hot days ARE quite handy when drying paint matters, having paint to use where I don’t need to worry about what I am inhaling is just GREAT! I don’t paint if the temperature is more than 30ºC, as per instructions… and find painting in the morning and evening essential at the moment because it is so very hot. I do remember having to be very careful when painting my exterior mural all those years back, and needed to hang bubble wrap over the entire surface to protect it from rain! I am painting on grey board…it is absorbent, and I thought I would need to use some fixative for the first layer, but I forgot to get some. It is indicated, but as the area is so small (compared to what it would be if painting a large wall) I am managing without it. I wish I had got some in order to make the paint layers a bit thinner, but with a fine brush and quick spreading I am getting away without it. The grey board varies in thickness. It is a little bit flexible, so not quite the rigid surface required but I don’t mind experimenting…It will most likely crack if bent, but I am not planning on bending it. And I am currently experimenting on some flexible surfaces with the intention of cracking the paint layer. So in some pieces I play things safer, using what I know of the materials I work with in order to produce a more predictable result. And in other pieces I am jumping out, breaking the rules of the usual application of the Keim mineral paint, and enjoying the fact that, as I am not using the materials with the requirements of a building application to be met. I spent a great deal of time mixing up the colours with the selection of Keim mineral paints I have available. And now I need to move forwards at quite a rapid pace, because they won’t last forever…Their shelf life is stated as being 12 months. I have found this varies a lot (and for my purposes, can be several more years, as long as stored carefully) but once I have mixed up the colours, I guess maybe because of air and some evaporation, I need to commit to some steady application! Yes, all types of paint have their qualities, but it’s so nice to use paint which is healthy and environmentally sound. VISUALLY it is pure as pure can be. None of the plastic quality of acrylic paint. Yes, acrylics can do many things well…I have not thrown mine out. But I won’t be using mine in the hot sun again for certain. But working with the Keim Mineral Paints is fantastic. When I come to wash out the brushes or whatever, I tip the painty water on the garden. Don’t need to put anything into the water system. I am not sure if this is good for the garden but the plants seem happy enough… No complaints as yet! If there are thicker paint layers in containers, it’s just a matter of letting it set and chipping it out. That goes on the garden too. I am also experimenting with the Keim Mineral paint in many other ways, which will no doubt seep out as time progresses! Above an example of the early stages of one of my paintings. I am seriously into circles and squares at the moment. Rests and motion, drums, drum beats, sound, filling space, boundaries, edges, meetings, ….That’s the poem. For those not familiar with the term VOC, paints used in the home contain ­potentially harmful chemicals such as ­solvents and volatile organic compounds (VOCs), and when paint dries, these chemicals evaporate into the air where the hapless artist or decorator inhales their toxic fumes. This is true for both water based (acrylic emulsions) and solvent or oil based paints. Inhaling paint fumes can exacerbate asthma and ­sinusitis, and because the solvents are absorbed into the lungs, then the blood stream, they can lead to headaches and dizziness. I have experienced this myself when working with oil paints indoors on a hot day. I keep my use of oil paints for cooler days, in a well ventilated area, and not on a very large format, where possible. Though I do confess to liking the smell of turps, I also realise that the fresher the air the healthier is my breathing! It’s worth being aware that when VOCs are inhaled, they can cause eye, nose and throat ­irritation. In large quantities, ­animal ­studies have linked these chemicals to birth defects, cancers and damage to the central nervous system. So best to breath fresh air! According to the World Health Organisation, professional painters are most at risk, for they have a 20 per cent increased risk of a range of ­cancers, particularly lung cancer. That’s a big percentage increase. So anyone using larger amounts of paint, regularly, on bigger surface areas, needs to consider VOCs and the effect on their health. There is even a ­neurological condition brought on by long-term exposure to paint solvents — ‘painter’s dementia’, which I guess isn’t that surprising. The World Health Organisation has also concerns about the long-term health effects of ‘off ­gassing’. Off gassing is the release of vapours over the life of the paint. (ie when it is on your walls). If you do use a large quantities of paint as an artist, then it’s worth using it as safely as possible. AND disposing of your paint responsibly. Keim Mineral paints have given me the freedom I need as an artist to experiment with paint in large quantities, but free from any concerns of impacting the environment, or myself or other people, in a negative way. If you are using large amounts of oil or acrylic paint, on a regular basis, then consider using a respirator mask if you want to be keeping your air as fresh as you can, and work in a well ventilated area, taking regular breaks. Now I can walk well with my new knee, I am pleased to say that I incorporated walking into my efforts for a healthy lifestyle. Still eating a bit too much sugar! This river business, with arc, is quite clearly something which is going to stay with me. It’s popping up all over the place. For myself, the significance of water is life. This feeds into my faith and belief as a Christian and follower of Christ, and should most accurately be read as an expression of that in most of my work. If someone wants to “read” the “meaning” of my painting in that way. Hopefully little things I write and say don’t detract from the poetry of the work which is my deepest motivation in creating it. Water as spiritual life, flowing from the Creator of all, and manifest through the sacramental incarnation of Christ in the world. Quite a mouthful! However, for those of you from different faith and spiritual traditions or none, I also, as I play with various concepts in my thinking and enjoy researching many dimensions of things I encounter in life, explore many other angles on the symbolic elements I experiment in my work and all of them add something very great to the whole process, and open many interesting avenues, all resonating in a meaningful way. All faith traditions have many areas of overlap and unity, and it’s vital to appreciate these, share them, and respect differences, accepting the other/s, in the way we would wish to be accepted ourselves. Love is the most important thing in life. Love God and love others as yourself. And communicating viewpoints with respect and peace. Other Christian people may enjoy the way my faith is centred and rooted, and resonates with their own faith experience, and maybe recognise some themes in my painting practice which stem from my belief system. But I don’t tend to describe myself as a “Christian Artist”. This is mainly because I am not attempting to convey a scriptural narrative or assert my work as specifically Christian, ie for Christians or for a Christian context. Who I am as a person is intimately connected with my work, but the complexity of a human individual goes far beyond their religious tradition and identity within that. All kinds of things have shaped my life. And while how my faith religious beliefs shape it is of interest to many, there are many other people who don’t find this dimension of my work of any interest to them. I paint for myself and, for all who are interested in my work, for whatever reason. For the purposes of search engines, then it’s common sense to use keywords which include Christian, because many Christians do seek out artwork created by others who share the same faith. But it is my hope that this doesn’t ever prove a barrier to accessing or appreciating what I do. I am sure many other artists from different faith traditions and belief systems feel the same way. Art is always there with the aim of opening eyes to new ways of seeing and experiencing the world. New perspectives tend to enrich life, widening and extending the borders of what we had previously embraced. Ooops, meandering and slightly digressing again! Water, and many other concepts and ideas around it, have a long term thread through my visual art practice. My contemplative practice and the research I do all feed into my painting and help steer the direction of it. Diocesan Spiritual Formation Group; Opportunities, events, resources and articles on prayer and spirituality Issue 27: February 2016. It is written by Chris Chapman. There are times when we don’t want to pray. We find that we are too busy to stop – but somewhere recognise that our activity is a way of avoiding the pain of silence where we might meet our own raw emotions or unresolved history. Or perhaps we are fed up with sitting there in the place of prayer and not getting anywhere. For all our efforts we remain distracted and restless, so far from the place of peace and understanding we desire. 1] Begin from where you are and how you are: So, perhaps your prayer starts ‘I am sitting here unwillingly’ or…’I am not able to trust you’ or …’I am angry with you’…or ’I wonder whether you really care about me’…or ’I am afraid of what you want from me’. 2] Acknowledge that part of you that doesn’t want to pray…look without judgement at this side of your being. Now seek out that part of you that does feel drawn to pray: a sense of invitation that arises somewhere from within, an impulse that comes not as an ‘ought’ but as a longing that perhaps you are not used to listening to. Listen to that desire now. 3] When are you most relaxed: walking, cooking, gardening, knitting, or losing yourself in a book? Imagine yourself sharing this time with God. You are not so much looking at each other face to face as being side by side, comfortably sharing the experience. Perhaps some words flow one way or another, but being alongside might be enough of a beginning. 4] Let go of trying too hard. So, rather than summoning up your concentration, fighting distractions that come, or trying to squeeze wisdom from bible verse that mean little to you…relax. Prayer does begin with intention, and with choosing to place ourselves in a listening, attentive place, but the rest belongs to God. Leave what comes or does not come from your time of prayer with God. Everything is gift. 5] Use you body to help you to pray. Hold you hands closed to make fists. What is held inside there…feelings, experiences, repetitive worries or thoughts? Now open your hands and turn them palm upwards. All those things are still with you but now there is air around them…now you are open to God who cares about you and about what you carry. Keeping your palms open, turn them so they face down. Now you allow what you carry inside to fall away. I am spending a lot of time in the garden right now. It is the largest area I have for painting in and so when the weather is good painting weather it is a priority for me to be there. Here are a couple of poems I wrote inspired by the beauty of creation. oriental blossom by Jenny Meehan © Jenny Meehan. “Crouched and Facing Bamboo in Light and Shadow” is an experiment with the shadow of the bamboo in my garden and a drawing of a crouched figure. 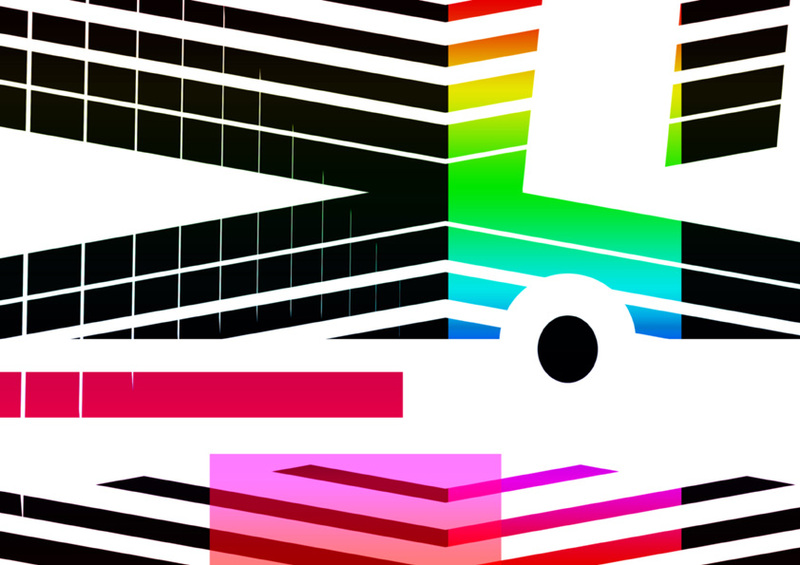 It’s still in progress as I am not 100% happy with it, but it has potential. It’s expressive of struggle, pain, pressing forwards. I have a lot in my garden. It makes very good paint mixing sticks. It makes useful paintbrush holders. And it is great for hanging things on. I love looking at it blowing in the wind. It’s so strong, and yet bends. It is spreading year by year. So I think I need to think up some other uses for it. I did make some bamboo pens, which worked quite well. I have a tree in the garden with blossom. The blossom is beautiful, but delicate, and it does not last very long. It’s fragile and white. The wind takes it and scatters it like snow. It looks just like snow when its falling. The London Plane Tree at the front of the house is another source of interest and inspiration . I’ve moved computers recently and cannot locate the full image digital file, but the purple picture on the top right is “Notation” which is based on an image of the London Plane Tree. And the blue image on the left is the base image I think. I took many, so not sure exactly but it looks like it. I do have extensive archives on hard drives and could locate the image quite quickly but I am so behind on so much I cannot be bothered to do this right now. I tend to use ice, glass, frost, snowflakes as metaphors for trauma, and the way that blossom, though soft and beautiful, looks like snow when it is falling, fascinates me. Falling snow melts, and snowflakes are beautiful, things can viewed as one thing soft, and alive, or conversely hard, sharp, painful. Falling implies surrender, even death. Healing from trauma when it happens is trans formative. It changes the way things are seen and experienced. Just a few here shown. But blossom and bamboo continue to inspire me! I really need to put some more of my artwork on Redbubble, but never seem to get around to it. I get a small royalty when someone buys merchandise on the site with my design on it. Please note, all my images are copyrighted and should not be used without permission under any circumstances. If you wish to obtain a license to use a work of art by Jenny Meehan, please contact Jenny Meehan in the first instance to clarify your requirements. This is quick and easy for both parties and is organised either directly with the artist or through a collective management organisation; DACS, depending on nature of use. This painting is one from the past, but still available to buy if anyone would like it. It is a rarity in my work, as it was painted outside, as you can see from this image. Langstone Harbour lies between Portsmouth Harbour to the west, and Chichester Harbour to the east. It is a tranquil and beautiful place, the heart of a dynamic urban area, and a vital part of an extensive biological system. The harbour is home for charter fishing boats and commercial fishermen, and hosts two commercial aggregate wharves. Many recreational activities including yachting, canoeing and windsurfing are also well established in its sheltered waters. Langstone Harbour is recognised internationally for its importance for nature conservation, and is a haven for aquatic wildlife and a myriad of bird species. I love water and water appears time after time in my work. As said before! 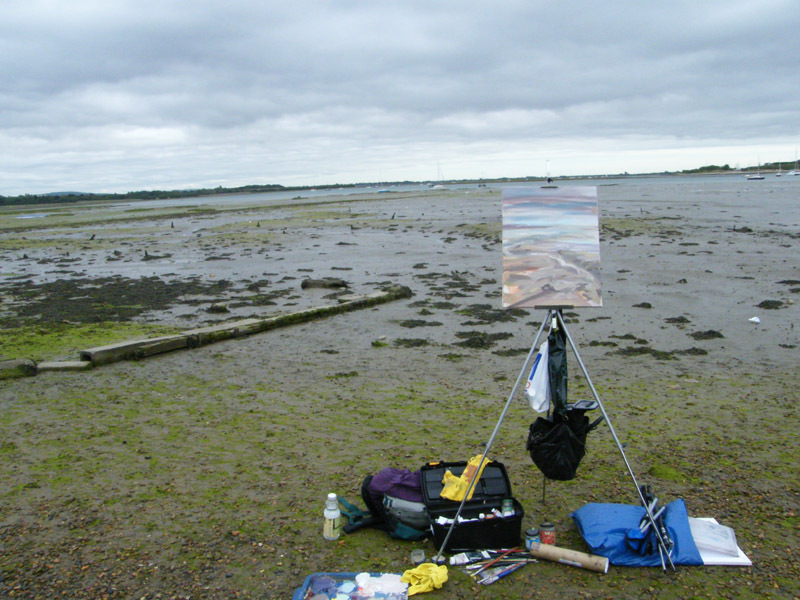 This painting was a very immersive experience, and as the tide came in, my feet did get wet! The canvas blew off a couple of times too! It started off with a very blue sky and then the weather changed for the worse, but I kept some blue in there! Well, better late than never, this post, originally for July, will have to suffice for August as well! I sell my paintings when no longer needed for study and exhibition purposes. At between £200 and £500 only, they are very good value indeed. For a high quality original abstract painting, you may need to look quite a long way for something in this price bracket. I sell my original paintings to enable me to continue to invest my time and effort into the painting endeavour. Developing my work, materials, research and study all involve time and money. It’s a matter of passion in the end. Any support is welcome and appreciated. Please contact me via my contact page on my website jamartlondon.com if my painting practice interests you and you are looking for high quality contemporary abstract painting by British female artists. I also have extensive archives of my paintings and photography which can be licensed quickly and easily through DACS.